KSC Metal Pegboard Strips let store and organize those tough to hang long items like shovels, brooms, and rakes easily. 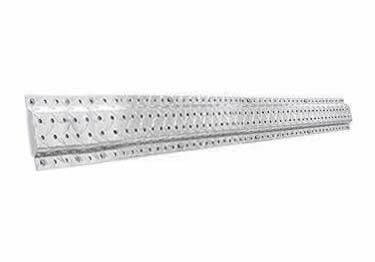 Constructed of heavy duty metal our pegboard strips will hold up to a 1/2 ton. Great for office, retail space, workshops, garages, kitchens, trade-shows, factories, and more. 4" height strips, 2 standard lengths: 96" or 48"
Comes in 2 sizes: 4"x96", 4"x48"
Can this be mounted and used vertically? KSC Metal Pegboard Strips let store and organize those tough to hang long items like shovels, brooms, and rakes easily. Constructed of heavy duty metal our pegboard strips will hold up to a 1/2 ton. Great for office, retail space, workshops, garages, kitchens, trade shows, factories, and more. I use these on a bare wall in my kitchen for kitchen hand tools and pots and pans. No more digging through drawers for the right hand tool, and no containers of hand tools taking up valuable counter space! I used them in my old galley kitchen, where 3 48" strips fit on one wall. It was a small kitchen with very limited storage space, and the peg strips both looked great an solved a kitchen storage problem! Thank you for your very detailed review, we appreciate the time you took to provide your feedback. A number of us have them and it certainly provides a great solution to organize kitchenware. I have some pegboard that is about 25yrs old. I had a big hook in the top row with pretty much weight on it, monkey wrench, couple of loping shears and the stuff ripped like cardboard. Put a strip of this along the top, covered the problem, not going to rip this stuff. Thank you for your review. We very much appreciate the detailed feedback and your positive comments about this product. wall to obtain extra space. No wood studs needed. I bought these to mount pegboard shelves for under a TV in the garage to hold the cable box and remotes. They look great mounted next to the diamond plate shelves. Nice packaging to prevent damage in transit as well. Magnetic Stainless steel, 10 colored steel, and Erasable White Board displays important information&artwork.